- With space for 6 groups. - Forward speed of 11 m/min with 0.75 CV motor. - The press is made of rubberized pulleys and shielded bearings. - The panel maximum height is 8 to 60 mm, minimum width 90 mm, minimum length 150 mm. - Anti-gluing product usage in the components entries, in order to avoid the adherence of glue wastes. - Automatic Double Spokeshave with individual oscillating tools Motor 2 CV, 12000 rpm, axis Ø 20 mm. - Diamond-coated tool included with Ø 80 X Ø 20 and 35 mm height. - For millings until 0,5 mm on pieces of 60 mm height, the maximum length is of 1200 mm (check for greater measures). - Straight gluer to glue the panel. 1,5 kg capacity. - Warming up system made by 5 electric resistances numbering 2000 W.
- Temperature control made with an electronic thermoregulatory controller. - Auto feeding system for rollers edges. - Glue box with Quick Change System. - Complete glue box with straight gluing axis to apply the glue on the panel. 1,5 kg capacity. - Tapping tool included for the machine perfect fit, quick change system. - Heating Support Desk for glue box coupling. - 700 x 500 x 500 mm height, with emergency key and quick change plus plug. - Piece tapes with straight or round corners, if the round side of the panel is perpendicular to the belt line. - 0,75 CV and 12000 rpm motor. - Ø 64 mm milling cutter and Ø 76 mm suction nozzle. - Quick Position Trimming System, with 4 pre-set measures. 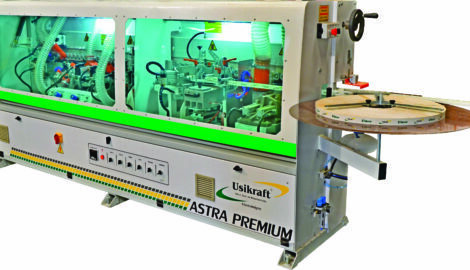 The Automatic Edge Gluer Astra Premium is equipped with the Quick Positions System, the mechanical adjustment of the groups in every tape switch. It is a big differential in the group adjustment, it is a practical, quick and accurate system. It is easy to adjust and it comes with 04 tape positions: 0,45 – 1,00 – 1,5 – 2 mm. It does not deregulate so frequently. - Eliminates small protrusions left by the milling cutter of the trimming group. - 150 mm cloth disk.